Short version: We learn a lot by watching a person engage in an “occupation” (a meaningful activity, which can be an activity of daily life such as making tea). And just because a person can do a simple task such as lift a 4 pound weight, doesn’t mean they can lift a 4 pound bag of sugar in their kitchen. See below for long version. “I also do PRN work for a small home health company after school. This setting allows me to incorporate many occupations into treatment sessions. Last week it was as simple as taking my client into her kitchen and trying a light cooking activity, making tea. I was able to assess her ability to reach overhead into her cabinet and retrieve a four-pound bag of sugar while standing. t too many diverse clients at once], we get set in routines of therapeutic exercises and modalities and lose sight of what the patent’s occupations may be at home. They may be able to lift a 4 lb bar 20 times, but will they be able to lift a 4 lb bag of sugar out of their cabinet? I loved this reminder. We need occupation and in appropriate context, to truly get a feel for the true functionality of the person. Yes, in a rehabilitation setting, maybe the 80 year-old client can lift that bar, the equivalent poundage of sugar. But at home, is that still true, when now she is dealing with different heights, different angles, different balances, and different sizes? Maybe not. OTs always love when their clinics do have kitchens so that they can truly work “in situ” for cooking. Now in this case, based on what the OT just saw, she can work with the client on many different things to help make it easier, although one easy thing is to suggest the client keep her sugar on a shelf that’s easier to access. 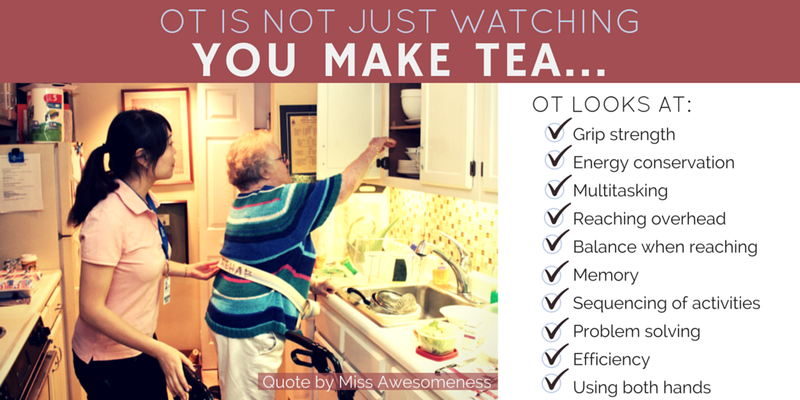 I want to note that sometimes it looks as if the OT isn’t “doing anything”, such as watching a client make tea. The OT isn’t doing a “Make tea. I will sit here until she is done. Yep, she did it. Check mark. The End.” The OT is doing what BJ described above – constant functional analysis. Is the sugar in an appropriate placement? Can the sugar go into a different container? How can we best work on the client’s grip strength? Let’s look more at her shortness of breath when reaching overhead. How can we quickly modify her kitchen setup to be more efficient for her? How is her balance in reaching, stooping, turning? How is her sequencing of activity, her visual attention, her ability to manipulate objects or hold things in both hands? Her problem-solving? Her efficiency? Multi-tasking? Memory? So you see, we are looking at a TON of different things, including overall physical ability, fine motor skills, cognitive skills, possible helpful modifications/adaptations/accommodations, etc. not just sitting there waiting for a “yes” or “no” as to whether the client can make tea. We just got SO MUCH information about her abilities just by watching the simple task of making tea (and “watching” is only true if the client is independent – often we are providing assistance, either verbally and/or physically). Updated 12/16/14: Exciting. I wrote this as a self-reflection/explanatory piece, but certainly informally and definitely not expecting a large audience. Wish I had done a nicer job now. Oh well. 🙂 The American Occupational Therapy Association (AOTA) linked this post on their Facebook page and made the infographic shown above! Overnight it’s been shared more than 1300+ times, liked by over 2500, and 130 new followers on my Facebook page for Miss Awesomeness at https://www.facebook.com/missawesomenessdotcom Definitely a nice surprise.